Bjorn Ironside was around 855 AD in The Netherlands was in Walcheren together with the other brothers. Maastricht, Nijmegen, Dorestad, Tiel, Oosterbeek and Utrecht are the places Bjorn has been. Oosterbeek he was there as Bjorn with Ragnar I assume and not as Bjorn Ironside. In the year, 850 AD Ivar, Ubbe and Sigurd (Halfdan) are travelling to Walcheren Zealand the Netherlands before they went to raid England. All three of them with an own army. In England, they called them Scaldingi in Dutch Schelde-Vikings. Where Ivar took most of England and Ireland. Ubbe took over many places also the island Walcheren in Zealand The Netherlands. When established here, he fought together with Ivar in England. 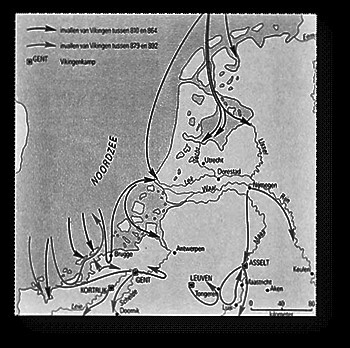 Ubbe and his army were found most in the North Sea the sea between The Netherlands and England. In 865 AD they left Walcheren to fight in England. Karel the Bold took over Walcheren. According to the source I am using Rollo also came to Walcheren because of a storm, and established in 850 AD in Normandy. One year later Ubbe raided Yorvik (York) together with Ivar and the great heathen army for more than 15 years.